Albert V Bazarian, aged 94, of Lake Forest, passed away on Tuesday, November 27. He was born in Summit New Jersey on December 14, 1923, the second son to the late Avedis and Araxie (Kazazian) Bazarian. He served in the Navy in World War II, after which he graduated from New York University (BS) and University of Pennsylvania (MS and PhD work) and pursued a career as an Electrical Engineer. His career was a great passion and afforded him a lifetime of productive and innovative work, during which he was awarded numerous patents in the field of surge protection. 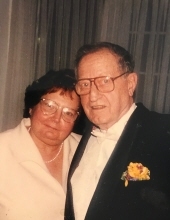 He was a loving man, devoted to his family and survived by his wife of 63 years, Elizabeth (Papazian) Bazarian of Lake Forest; three daughters, Linda Bazarian of Chicago, Diane Fleming of Lake Forest, and Nancy Bazarian of Lake Forest; two granddaughters, Margo and Nelli Fleming and seven nieces and nephews. To plant a tree in memory of Albert V. Bazarian, please visit our Tribute Store. "Email Address" would like to share the life celebration of Albert V. Bazarian. Click on the "link" to go to share a favorite memory or leave a condolence message for the family.